Brian and I both really like salads, especially with interesting ingredients such as roasted beets, walnuts and cheese. Definitely cheese. Feta is great in salads but there's a special place in our hearts for goat cheese. Just plain old crumbled chevre is fine but when it's sliced into medallions, breaded and fried so that the outside is crispy and the inside is gooey...well, that's just a heavenly experience. It's also an experience we usually reserve for dining out because we tend not to fry things at home. If you read this blog regularly then you're probably familiar with my chronic DFP (deep fry phobia) and know that I tend to "fry" things in the oven. Why, then, it had not occurred to me to try oven "frying" goat cheese before now is a mystery? Perhaps I assumed it would melt but, with a little preparation, I was able to replicate both the crispy and the gooey. Enjoy! Pre-heat the oven to 400 degrees and make sure it's fully pre-heated. Slice the goat cheese into four, 1oz. medallions and place in the freezer for 15 minutes. Dip each medallion into the egg and then into the breadcrumbs. Place on a baking sheet lined with parchment paper and spray a small amount of non-stick cooking spray over each piece. Bake for 15-20 minutes or until the medallions are lightly golden brown. Serve immediately. Makes 2 servings. I have no deep fry phobia, but it breaks me up a bit that I haven't had these babies before. YUM! Oh, I know I would love this!!! And love the option of baking instead of frying also! It's wonderful when you can still achive that crunchy coating without having to fry the food! Great post! What a fantastic idea!! I would never have thought of this but YUM! I love this! Way to spice up a regular salad! I also love just rolling some good old chevre in chopped herbs or pistachios!!! Yum! It looks wonderful! But only two? I love my warm goat cheese medallions. Oven fried is even better! OOhh!!! I could clear a plate all by myself. And since my own Brian won't touch goat cheese, the plate would be all mine! I love putting fun toppings on my salads too. And goat cheese, oh goat cheese, I just love it! Great idea to oven fry! Perfect topping for a simple green salad...brava, my friend!!! I've had fried feta once and loved it! This looks DElicious and definitely something to try! My husband and I both love goat cheese. It's about the only cheese he will eat other than cheddar (or American but I don't think that counts). that is such a great idea for goat cheese!! This looks amazing! I also have a deep fry phobia and have never tried "frying" things in the oven, but I will definitely start with this. Yum! Looks fantastic! 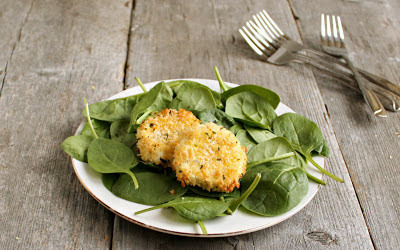 I love goat cheese but never fried it before...sounds divine!!! Lovely! 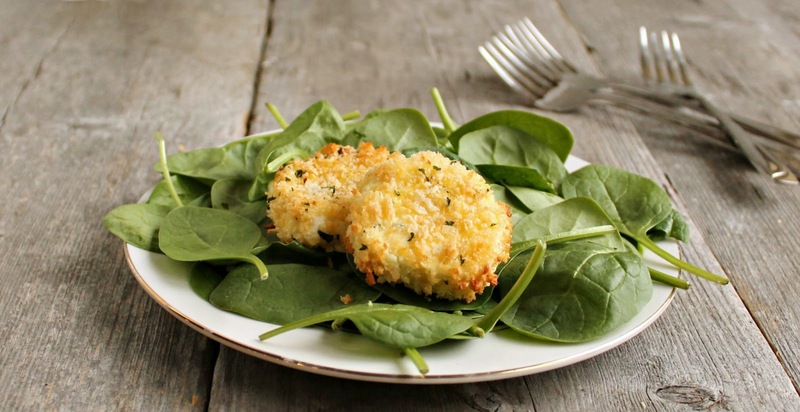 Try replacing the Panko breadcrumbs with roughly ground pecans! In the meantime, please make me a dozen or 3 of these and deliver them??? Pretty please? I have tried to like goat cheese but it is a taste I just can't get used to ... maybe I would like them this way. Thanks for sharing on Foodie Friends Friday and I hope you will join us again this coming week. I didn't have panko, but regular bread crumbs worked well. Delicious addition to my salads. I am an goat cheese addict and love this! I bet the goat cheese is fabulous and almost like croutons! Another great thing about oven frying is less mess! Can you make it in a one piece log? ?